I hope everyone had a wonderful Christmas!! We had a very sweet Christmas at our house...the time with my daughter and son-in-law passed by too quickly, though, but was sweet!! I LOVE Christmas, but am ready to put all the decorations away and begin the new year... I am REALLY ready for Spring...my son-in-law informed me that Winter had just begun the day before I proclaimed this to everyone...oh well...I'm still ready for it anyway...and with Christmas over, we're on our way to it!! With my sister home in Miami and my children home in Nashville, the craft room is once again mine...but will admit that getting the mojo back is slow going...what fun being able to spend time with my stamps and paper again, though!!! Had need of a guy birthday card, and he has a love of music(has an incredible voice), so had to have music on it somewhere. My husband puts the Beatle's Birthday song on other's Facebook pages for their birthdays, so thought the sentiment was PERFECT!! So nice to have so many star dies...used Stampin Up and Papertrey Ink's dies, along with a Fiskar star punch. Here's what I did: Used a 2" strip of bazzill java paper. The top cut out is the punch, the bottom two are Papertrey Ink die cuts. I used dotted red bazzill paper and thin chip board for the stars, the top and bottom are the 2 smallest Stampin Up die cut stars, the middle one is the star punch. 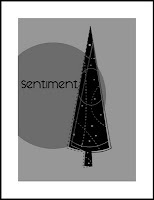 The sentiment is Hero Arts, the score is Stampendous. Yeah!!... it's good being back...hope to visit you all soon!!!! I just wanted to say Merry Christmas to all you who visit, read, and comment on my blog! I hope you all have a wonderfully blessed and very happy Christmas!! Less is More...Let it Snow and One Layer...a Little Late. This has been a crazy wonderful week for my son and family...my son was given a van on Tuesday...a TOTAL surprise and our Christmas miracle!!!! I have been out with Noah for the last couple days, today he had his first haircut at the barbershop in a year(I had been trying to keep his hair trimmed, but getting him there had been too challenging so I took to cutting it). I have been crying and crying (in a good way), what an INCREDIBLE BLESSING!! You can read more on Noah's Wheels the site my sister Rebecca began earlier this year to raise money for our Noah...she is incredible....our Thanks to the We Promise Foundation and all who were a part of our son's gifts...what an incredible BUNCH of people...we are so loved and love them so!!! All that to say, with my sister here, and all this going on, making cards and getting to other's blogs was not on the radar. I made a card for the Less is More Let it Snow challenge just now, but it is 6pm and I am too late because going by the time in the UK, it is 11pm and the challenge closed an hour ago, their time....but I am going to put it up anyway! The image stamps are Darcie's and the sentiment from Penny Black. Stamped and colored with SU inks, water and paint brush(pretty in pink, regal rose and crumb cake)...kind of watercoloring, but on bazzill paper. Added light pink rhinestones in centers of each snowflake....hope you have a great weekend....One week until Christmas...EEK...still so much to do!!! My sister is visiting, so...stamping's on hold until Thursday...BUT...I stamped this image before her arrival, cut it out while we were talking the other night, colored(while talking to my mom) and put it on a card all while she was in the shower this morning....I just HAD to make a card...I AM funny, huh....lol!! This is a stamp from Inkadinkado, the sentiment, as well. I stamped, cut out and colored with Old Olive, Certainly Celery, Regal Rose and Melon Mambo for the pinks. layered on textured old olive and white bazzill paper. See you Thursday or Friday! Super simple...a Penny Black stamp colored with old olive and certainly celery...dotted with pink Liquid Pearls, with Hero Arts sentiment and layered on old olive and textured pink pirouette, with pink ribbon. I don't know what it was, but this card made me happy?! Maybe it was the pink...BUT...it's already in the mail as I'm writing...what joy to actually send a card I've just made....lol!! I had been intrigued with how my paper looked when I would die cut a poinsettia to make a layered flower for recent cards. I decided that I would attempt to make a card with the cut outs being the card in lieu of a layered flower. I also remembered Jenny's CARD(one of my forever favorites!! )...so this was a card of many inspirations!! The challenge for Less is More this week is to use the color green. My daughter had a party with friends here last night, so Noah and I took to my craft room and watched Polar Express and Home Alone 2...and I made cards!! What fun!! Here's what I came up with...fast and easy(the cards AND post)! This third one has blue in it...couldn't escape the sky. The trees are two stamps from Heartfelt Creations. Stamped both stamps in Artichoke(loving that green!! )...sponged with bashful blue, masking a bit for the clouds and under the trees...added Hero Arts sentiment and dotted with white gel pen for snow in sky and on trees...I PROMISE there's snow...you need to click on the picture to look closer! Initially was a bit stumped by the green, but once I started thinking about things other than trees, it became fun!! Must run...have to brush up on chapter 3 of Algebra before my tutee gets here (yes, I looked it up, one who is tutored is a tutee...I won't tell him that!! )....have a great day!!! I made the holly panel for this card weeks ago...decided I HAD to finish it...so made the poinsettia today and have yet another card for Christmas! It may seem funny, and I don't know how many other stampers are like me, but I don't really send many cards out at Christmas. My daughters, and their friends are enjoying many of my Christmas cards this year...I simply enjoy making them:):):)!!! I made the panel with the holly using a sizzix stamp and die combo. You stamp the image, then emboss it with the matching folder. I put some sand colored ink on the inside of the folder before running it through...a technique that Jennifer McGuire showed us in the Christmas Boot Camp Class some weeks ago. I then used the layered die from Spellbinders for the poinsettia and Martha Stewart holly punch for the leaves. The sentiment is from Hero Arts, versamarked and white embossed and the swirled background on the red card is a stamp I bought on ebay...it says JRL Designs on the side of the very large background stamp(all this time I had thought it was Stampin Up...go figure...lol!!) stamped with versamark for added dimension. Put a glittery red stick on dot in the center of the flower...have some more cards to show you tomorrow, when the sun is out and I can once again take decent pictures:)!! I used a stamp set and die from Papertrey Ink(Sweet Baby). I cut out the giraffe and attached her to a die cut piece of chip board for stability. The paper I used for this card was from Close to My Heart. I also used the lacey nestie from Spellbinders and dotted embossing folder from Sizzix. Added brown pearls around the circle and ribbon around the giraffe's neck. What I thought was SO neat was that, UNINTENTIONALLY, the giraffe has an EYE...AND a flower atop her head...toooooooo funny!!! I think, because of the patterns, my card looks a little complex, but clean and simple it really is:)!!! 1) use ONLY a sentiment stamp on your card...no other stamps or embellishments allowed! Some of you may find this challenge particularly difficult because a single sentiment looks so excruciatingly clean and simple. Look for really interesting sentiments in your stash, and then think how you could make it even more interesting with colors, placement, shape of card. If you must, consider embossing lines to frame your sentiment, masking and sponging, using resist techniques, etc. 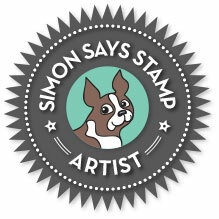 Just don't use any other stamps or embellishments. The Thinking Of You stamp is from Hero Arts. The first one, I stamped with versamark and clear embossed. I then masked above and below with Eclipse tape and sponged Black Soot distress ink over the sentiment. I then scored two lines on top and bottom with Martha Stewart Score Board. This card and the next are 4"x 8"
This one I stamped sentiment at same line of gridded acrylic block on card ...starting with middle sentiment and then placed part of same on either side. Stamped with Taken With Teal and clear embossed each separately. Dotted with black marker in between sentiments and scored on top and bottom. This one was the one that I cut down...lol!! It is 4" x 5". I stamped with versamark and embossed with black. Then I punched 5 hearts with SU punch on typing paper, and placed over the sentiment....Susan did say we could sponge and mask???! !...No stamps were used in the making of these hearts...here is my scrap paper after I crumpled it and threw it away...retrieved it and unraveled to show you my methology...I'm funny!!! This blue one is simply versamarked, white embossed and scored on standard sized textured bazzill card.